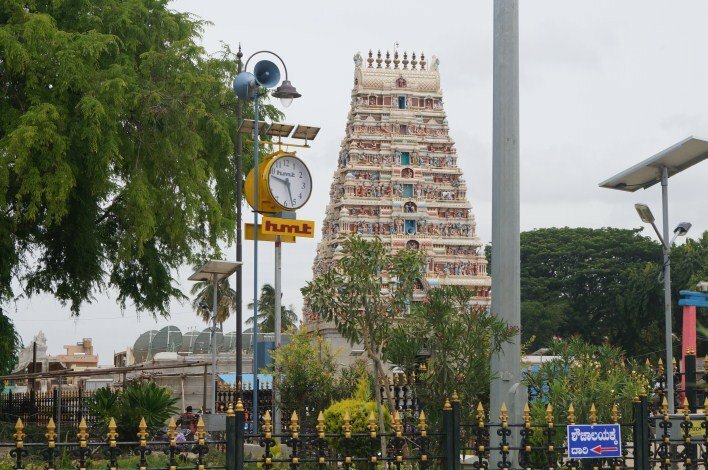 Yediyur Siddhalingeshwara Swamy temple is located on the Mangalore- Bangalore highway (NH 48). It is at a distance of 95 KM from Bangalore. The temple is situated in the Kunigal town of Tumkur District. The Yediyur Siddhalingeshwara Swamy temple, an ancient Hindu shrine, is one of the eminent pilgrimage centers. Siddhalingeshwara is the temple’s deity. Although known as a temple, it has a Nirvikalpa Shivayoga Samadhi of Tontada Siddhalinga, a well known Virashaiva saint belonging to late 15th century. Every year the temple holds a 15 day long ‘Jathra’, starting from the 7th day after ‘Ugadi’ (Hindu calendar). The ‘Jathra’ is conducted to mark the attainment of Samadhi by Sri Siddhalingeshwara Swamy. 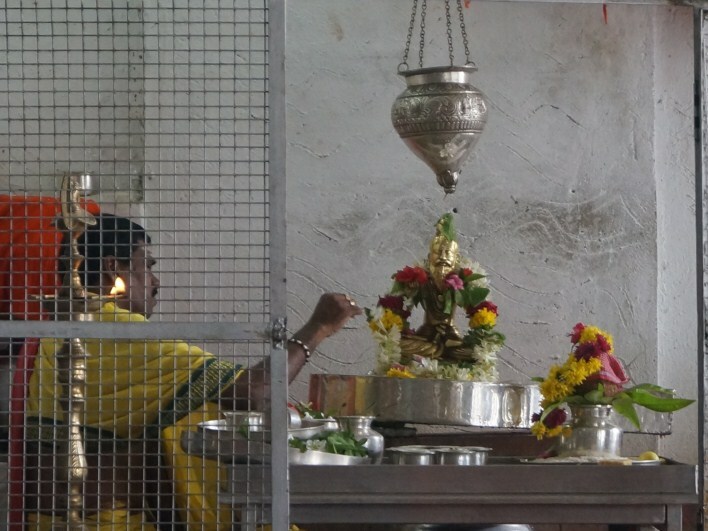 During Maha Shivarathri, a Hindu festival, Sahasra Rudrabhisheka is performed at the temple. The last day of Karthika masa is celebrated by lighting Laksha Deepa (one lakh lamp) around the temple. During the month of Shravana special poojas namely Sahasra Kamala pooja and Laksha Bilvarchana pooja are performed. On every new moon day, Kumbhahisheka is performed in the temple. The annual car festival is held by the temple on the 7th lunar day of the Chaitra masa (March-April). Lakhs of devotees arrive during the above mentioned special days to witness the event. You can visit the temple during this time. Yediyur is the final destination of Sri Siddhalingeshwara Swamy. He was not born out of a mother’s womb but, appeared as an infant to a childless couple, Mallikarjuna and Jnanambe. He traveled extensively in his life preaching eternal truth. He is a renowned Virashaiva teacher and author. Shathsthala Jnana Saramrutha, a collection of 701 Vachanas (poems), is his literary contribution. He was also a chief of Murugi Mutt. Abode of Sri Siddhalingeshwara Swamy’s large number of disciples, some of whom have also written on Virashaiva faith and philosophy, Yediyur is considered to be a seat of awakened spiritual consciousness. Sri Siddhalingeshwara Swamy temple is revered by many devotees who have a strong faith that their prayers and vows will be fulfilled. Sri Siddhalingeshwara Swamy is considered to be an incarnation of Lord Shiva. He is known to perform miracles on large number of people belonging to different caste and creed. Many sick and suffering people are believed to be cured by his divine powers. The temple is a large Dravidian structure facing the North. The temple houses a ’Gaddige’ of Sri Siddhalingeshwara Swamy, a lump of Vibhuthi, is covered by Linga Kanhe form. Placed on top of this is a metallic sculpture (Utsava Murthy) that is used during procession. The metallic image bears a resemblance to the stone sculpture at the main gate. The temple has a large wooden chariot (ratha). Near the temple’s Mahadwara (main door) are some inscriptions which describe the spiritual greatness of the teacher. Beautifully colored ‘Gopura’ of the temple depicts various incidents of Sri Siddhalingeshwara Swamy’s life. One can find certain inscriptions even on temple’s bells, jewels, vessels etc. At the basement of the main sanctum is a small shrine of Sri Veerabhadra Swamy who also looked upon with great respect and worshipped by people, similar to Sri Siddhalingeshwara Swamy. Yediyur Siddhalingeshwara Swamy Temple is well connected to Bangalore, Tumkur and Mangalore by an excellent road. There are also lots of buses plying from Tumkur, Bangalore, and others cities of the Karnataka.